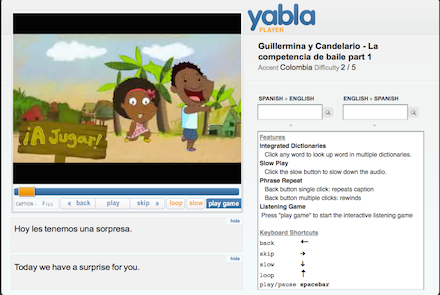 Yabla is a website that was designed from the ground up specifically and exclusively for helping people learn languages via videos of popular media in the language they want to learn (TV shows, cartoons, documentaries, etc.) that you can watch (streaming) on the site. 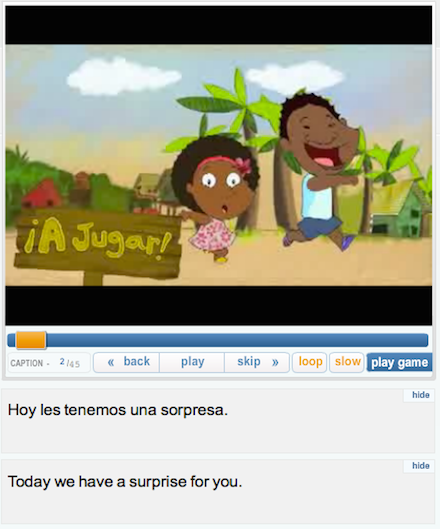 They have a collection of Spanish-language videos that they have amassed over time (1550+ videos at the time of this writing, and they do add more from time to time), primarily consisting of popular media originally intended for native speakers such as TV shows, cartoons, documentaries, and music videos. This is precisely what you want in my opinion because that way the Spanish you learn is normal, everyday, Spanish – how people actually talk. It’s not some contrived, weird-sounding (to native speakers) hypothetical that’s been put together for Spanish students (like what you might have seen in a language textbook at some point). Please note that the above is only the left hand side of the screen, I’ll get to the right hand side in a minute. Not only that but take note of the additional buttons you see above: “Back” will skip the video back precisely one sentence thereby allowing you to repeat something you’re having trouble with until you get it, “Skip” moves it forward one sentence, “Loop” plays the same sentence (whichever one you’re currently on) over and over again for you (again, very useful for working on something you’re having trouble understanding and/or pronouncing), and “Slow” slows the video down to, I’m guessing, 1/2 speed. The combination of the “back” or “loop” button along with the “slow” button is just an absolute winner: if you’re having trouble understanding and/or pronouncing a phrase, simply slow it down to 1/2 speed and then play it over and over again with the “back” or “loop” button until you’ve got it at that speed, and then click “slow” again to bring it back to normal speed and play it over and over again until you’ve got it at that speed, and Ta-Da! Done! 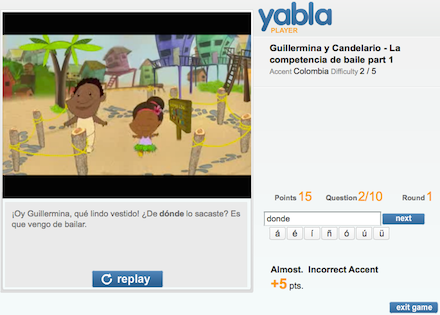 You just learned to comprehend and/or speak a complete Spanish sentence at full speed! Excellent! *A quick note on the “comprehend and/or speak” bit: if you’re only working on listening comprehension then you would just replay the phrase until you can understand what they’re saying, whereas if you’re also working on your speaking ability – you want to learn to say what it is they’re saying in the video – then you would replay the phrase and each time repeat after the native speaker in the video, continuing to do this over and over again until you sound just like them. 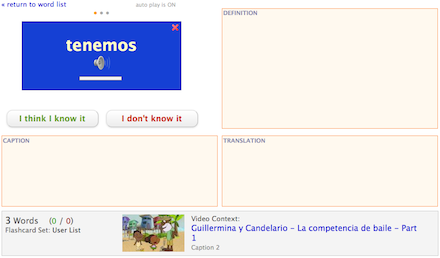 Notice how the context the word was originally used in – the video that you added the word from – is linked to down at the bottom so you can click on it and go to it, plus it tells you which specific subtitle (they call it a “caption”) the word was used in (in this case “Caption 2”) thereby allowing you to just skip ahead in the video to the specific phrase the word was used in so you don’t have to watch it all the way through or skip around looking for it. Nice work, overall. Videos of a wide variety (including cartoons, my favorite) and they can be ordered by difficulty! There are many different categories: Action, Animation (cartoons), Art/Culture, Comedy, Drama, Documentary, Economy/Business, Food, Lessons, Music, Musicians, Newbie, People, Science, Society, Sports, Travel, and many more. There’s something for everybody, which helps to prevent you from getting bored or running out of things you want to watch that you’re actually interested in and will keep your attention. I believe that using media (TV shows, movies, books, etc.) that actually interest you is massively important – otherwise you get bored and quit – so this is a huge benefit in my opinion. Not only is their a wide variety, but there’s a wide variety of difficulty in videos available: that is, they have everything from very simple, slowly spoken, children’s cartoons that use very elementary language – which is perfect for a beginner – to TV shows and documentaries intended for teenagers and adults – which would be more suited to an intermediate or advanced learner. Plus, each video is rated at a certain level of difficulty from 1 to 5 and you can order them by difficulty (or how recent they are, or by title) – this is extremely useful. You can do this with all the videos or you can narrow them by category first and then order them however you’d like. Oh, and of course you can also search for videos by entering the title or any word that you can remember from the subtitles or description (each video includes a short description). I noticed that all the videos seem to be 3-5 minutes long, which is just about the perfect length for a beginning to intermediate level Spanish learner. In the case of TV shows or documentaries where each episode is obviously longer than that, they just break them down into parts (Part 1, Part 2, etc.). Which dialect/accent do you want to learn? I intentionally misspelled “dónde” to see what it would do (I didn’t accent the “o” as I should have) and was pleasantly surprised to discover that if you otherwise spell it right, but miss an accent mark, it’ll give you half credit and tell you that the problem was a missing accent mark! This is a surprisingly well thought out system. Oh, and your score is kept track of via a point system with 10 points for correct answers, 5 for correct but without the right accent marks, and 0 for a wrong answer. 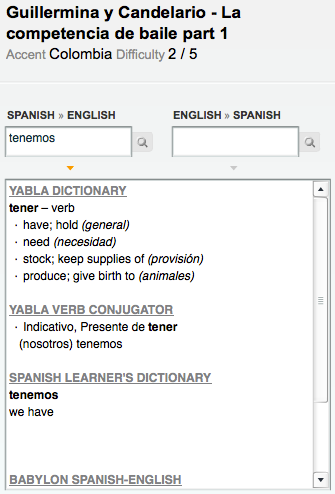 Yabla allows teachers to create “classes” that their students can later join and do homework in. The teacher as well as each student gets their own account with its own login and password. 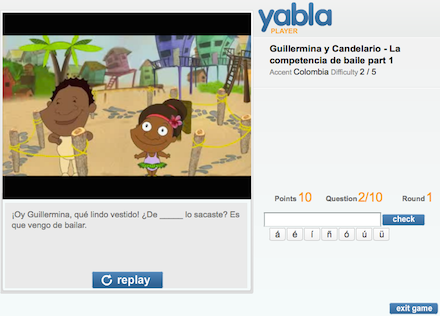 The homework consists of watching assigned videos, playing the game (described above), and getting points for doing so. As the students complete the assignments you can monitor their progress with detailed reporting, thereby ensuring that they’re actively engaged and to what degree each student is completing the assignments. To learn more about the school/group program and check current pricing go to the School & Organizations section of their website here. 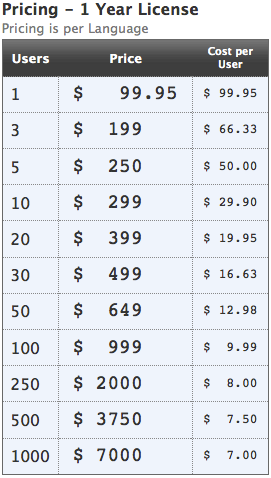 $9.95 a month for individual users as of right now. That’s it. Which is damned cheap all things considered. I’m not going to tell you that you should buy it – I don’t know your exact situation so I can’t say for sure – but I will say that I think it’s an excellent overall system, it’s great for teaching yourself Spanish, and I think that it’s a very good deal. Go here to check out their website, watch the intro video, try out some of the demo videos for yourself, and sign up if you like. Hope that’s helpful for you, don’t hesitate to let me know what you think.